Constance Gusko, 95, of North Arlington, passed away on Saturday, March 10th, 2018. 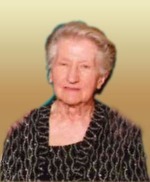 She was predeceased by her beloved husband Walter and her daughter Barbara Gusko. She is survived by her niece Carol Harris and great nephews Thomas and Timothy Harris. Graveside Service will be on Thursday March 15th, at 10:00am in Holy Cross Cemetery, 340 Ridge Road, North Arlington.